Customer Service is getting a bad rap. Yes, there are those dreaded computerized telephone systems that frustrate even the most patient of customers. And, there are plenty of customers that need some straight talk. But there are countless customer service and support staff that want to help out. Here is where our name badges fit. Give your customers find a personal point of contact. Connect with them and build trust. Let customers know if they are speaking with a real person – and if this is a senior manager, a trainee or a staff member. While no name badge can make a wall-flower into a glad-handing politician, name badges do create a personal touch. Until now, only the largest of firms could afford to design and order branded, full color, personalized name badges. Our mission is to bring this same professionalism to everyone else. We offer hundreds of different templates and backgrounds. Choose from our own pre-selected themes, or create your own. Our technology is truly a generation-ahead. You can see your name badge proof online. Designs go directly from your desk to our digital printers. All of your orders are available online for easy edits or instant reorders. Then, when you supplement these advantages with our "fair deal" affordable pricing and industry-leading delivery, you can see why we have been so successful. Customers have ordered hundreds of thousands of badges from us. 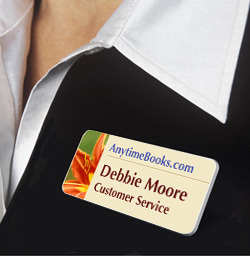 name badge is really a combination of two factors: a name and your brand. As a result, we understand that each project is unique and must be handled with great care. We encourage you to call us at any time. Even though our technology is state-of-the art, we know that a personal touch is never out-of-date.